On the surface, the Fastbraces® system doesn’t appear to be too different from traditional braces. But as Dr. Raymond Hatland’s patients already know, Fastbraces® technology offers many advantages over to traditional braces — most importantly, accelerated results and shorter overall treatment times. Read on as Dr. Hatland compares the two options and highlights some of the incredible benefits of Fastbraces®. Traditional braces are designed to fix crooked, crowded and misaligned teeth or large gaps in between the teeth. Braces can also repair issues with the bite (i.e., the way the top and bottom teeth come together). 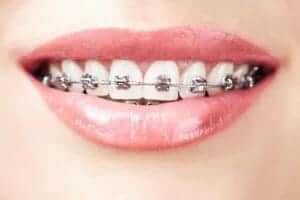 With traditional braces, brackets are cemented to the front of the teeth and connected with a wire. During the first year of treatment, the crowns of the teeth shift into the desired position; in the subsequent year, the roots of the teeth follow and move toward their final position. Just like traditional braces, Fastbraces® can be employed to fix crooked, crowded, gapped or otherwise misaligned teeth, as well as a bad bite. Fastbraces® also relies on a system of brackets cemented to the front of the teeth and connected with a wire. But the brackets and wires are specially designed to upright or straighten the tooth roots from the very beginning of treatment. This is a highly efficient method that produces results in months rather than years. Most Fastbraces® patients complete treatment in four to nine months, compared to two or more years spent in traditional braces. In addition to accelerated treatment times, Fastbraces® is also more comfortable than traditional braces. Dr. Hatland’s patients report very little pain or discomfort over the course of their treatment, probably because the innovative design of the Fastbraces® patented wire and brackets exerts power over the entire root surfaces as opposed to just putting pressure on small hot spots of the teeth. Also, because treatment time is significantly shortened and less office visits are required, Fastbraces® is more cost-effective than traditional braces. This helps make treatment accessible to a wider range of patients. If you are interested in achieving a straighter smile in less than a year, Dr. Hatland can help. Call or email his Chicago or Indianapolis office today to schedule an informational consultation.